Last week, I addressed the pros and cons of using Hootsuite for social media management. This week, I review another popular tool, Sprout Social. Well-organized dashboard. Of the features Sprout Social offers, the way it organizes information is the most advantageous. As I mentioned in the previous article, Hootsuite arranges content in spreadsheet-like columns, which can seem overwhelming until you get used to it. Sprout Social, on the other hand, separates subject matter into six distinct areas: Messages, Tasks, Feeds, Publishing, Discovery, and Reports. Sprout Social organizes information in six areas. Messages from fans and followers appear in a single stream. You have the option to filter messages by social profile. If you only want to see activity from Twitter, for instance, you can deselect the other profiles. Users can filter the messages they want to see. As you work through messages, clicking the checkmark icon removes them from the queue, which is a convenient way to keep the stream current. Click the checkmark icon to remove messages from the stream. Tasks. The Tasks area is for businesses that have multiple social network administrators; it is unnecessary for single users. Feeds. The Feeds component is useful for identifying keyword-oriented content that you could incorporate into posts, or as a way to monitor your brand and product names (and your competitors). However, you must use the Feedly RSS reader. Publishing. 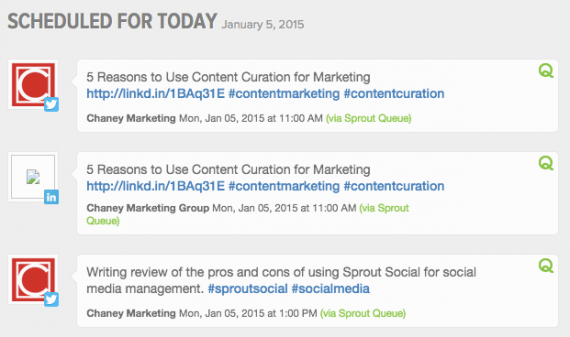 Like Hootsuite, Sprout Social allows message scheduling. One unique feature — Queue — automatically schedules posts for publishing based on pre-selected time frames. You can also customize posting times — up to 10 per day — for when your audience is most likely to see them. Discovery. 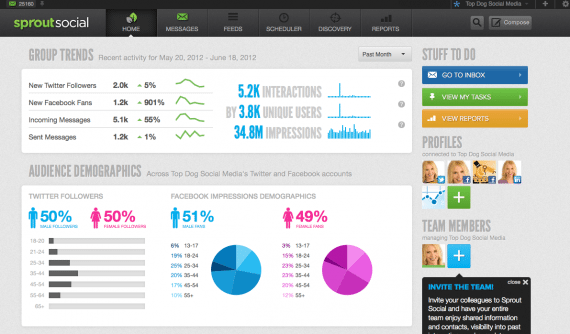 Discovery is one of the most attractive features about Sprout Social’s dashboard. It presents a list of your followers, people with whom you have interacted, and those who have mentioned you in a tweet. 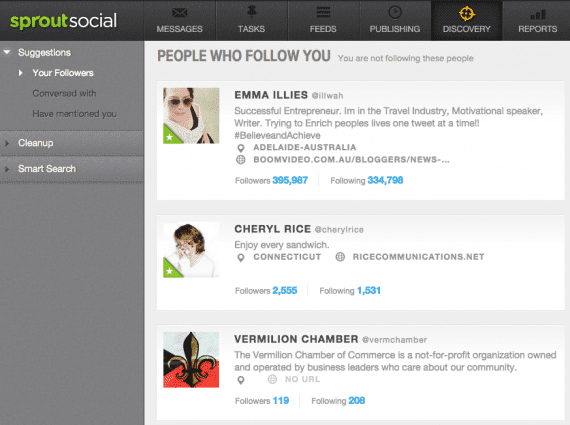 Discovery lets you see Twitter follower profiles. By clicking on the individual’s card, you can see his or her complete profile. That is useful in determining whether or not it’s worth your time to pursue a closer relationship, such as for sales and marketing. 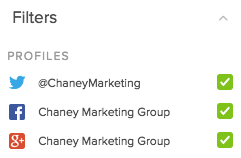 Another feature is Cleanup, which allows you to unfollow silent accounts (those that have no publishing activity), those who publish intermittently, and those who do not follow you back. Lastly, with Smart Search you can enter keywords related to your business or industry to find conversations to join or people with whom to engage. It is also useful for brand monitoring. One disadvantage to Discovery is that it only includes information from Twitter. Analytics. The first thing you see when you log into the dashboard is analytics. That is important because it gives you near real-time snapshots and aggregate trends that help you better understand your audience. Analytics reveals a snapshot of your audience. I call this “throughput analytics,” as it lets you know what is happening with your social engagement activity at any given moment. By connecting with Google Analytics — which Sprout Social enables — you gain a fuller perspective of the value such activity provides in terms driving traffic and sales. Reports. 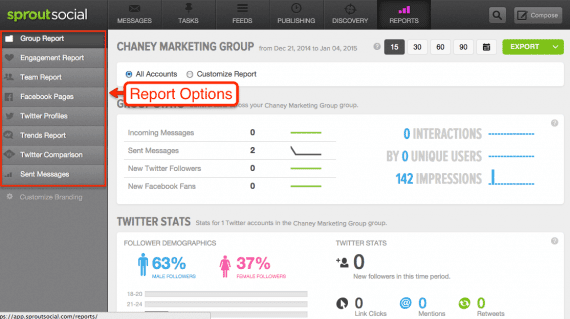 Sprout Social furnishes several report options. Unlike Hootsuite, Sprout Social does not charge additional fees for the reports. You can see data from Facebook pages and Twitter feeds, and get a trends report that includes such items as frequently mentioned topics and hashtags. Reports show Facebook and Twitter data. Limited number of social networks. Unlike Hootsuite, Sprout Social limits user access to four social networks — Twitter, Facebook (page and user profile), Google+ page, LinkedIn (company page and user profile) — and a single Feedly RSS reader account. The platform does not integrate with Pinterest or Instagram. This is unfortunate given the growth of visually oriented networks. Compose window. Of all the advantages Sprout Social’s dashboard offers, the Compose feature is not one of them. Click the Compose button to enable posting. First of all, the Compose function, which you must click a button to open, is tucked out of the way in the upper right-hand column. It is difficult to notice. Even though I used Sprout Social routinely in the past, I found myself having to search for this button. The platform would benefit from a more obvious placement. Lack of LinkedIn integration. Although you can publish to LinkedIn company pages and user profiles via the Compose window, Sprout Social does not incorporate LinkedIn’s feed into the Messages stream. Neither is LinkedIn activity tied to any report. Sprout Social would do well to integrate LinkedIn further in much the same way it has the other social networks — a feature B2B merchants would likely appreciate. Higher cost. Sprout Social’s pricing starts at $59 per month. That is a considerably higher price than Hootsuite, which starts at around $10. Sprout Social offers a 30-day free trial with no credit card required. 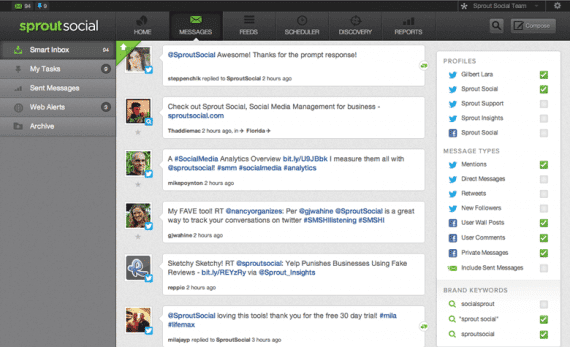 I prefer Sprout Social’s dashboard to Hootsuite’s. Additionally, Sprout Social’s analytics, brand monitoring, follower management, and reporting capabilities are all useful and practical. The fact that it integrates with fewer social networks than Hootsuite is Sprout Social’s major drawback. That, along with the higher price, may make it difficult for smaller businesses to justify.